This little boy is the cat's meow, the bees knees, the sun, the moon and the stars. He is my little Prince Charming and makes me happy to get up in the morning just to see him smile at me with those little dimples. Yes I am smitten. Yes, I know he has a dirty face and he's in his pajamas-this is him though, crazy, loud and messy. Boy, sweet, boy! This little princess is just that. She is growing up way too fast, and sometimes I look at her and think-wow that girl is stunning, I can't believe she's part me! I just took some little personality shots from today...Remembering how cute my kids really are! Fill greased muffin tins 3/4 the way full. I am going to stop here to say that I LOVE my muffin tin. It is metal with red silicone cups-and this being the only silicone I can afford at the moment (you know what I'm talkin about ladies-can all the nursing mama's give me a 'heck ya! '), they make me sublimely happy. Easy to clean, pretty to look at, and cuts my baking time way down! Love ya little muffin pan! Bake at 375, mine took 15 minutes-they might take a little longer depending on your kind of pan and your altitude-but they are done when a toothpick comes out clean. Let cool for 5 minutes, if you can wait that long before removing from pan to wire rack or just popping the hot little yummy in your mouth. Recipe adapted from a Taste of Home recipe by Joanne Shields. I added a new feature to my blog at the top right hand corner. I thought you might like to know about giveaways that are going on, that I have found interesting and entered myself-you can click on the links and find out how to enter yourself. I'll keep this updated as well as I can-if you know of any good ones-let me know! The one I want to win right now is from "inevergrewup" It's a bumbleride double stroller. Smile as I hear the crushing of plastic. ***EDIT: No I do not like the Sit n Stand stroller, unless you are only using it to walk around the mall, you will not like it either. It does horrible outside, weighs like 100 pounds and is just a pain. If both kids fall asleep, like they often do at the same time, the bigger kid has no where to lay. I have taken it to the Oregon zoo and just pushing it up one hill, I was cursing like a sailor at the dumb thing. So if your husband is the only one who will be pushing the stroller and he likes to show you how manly and strong he is, or you only take your stroller shopping, than the Sit n Stand is for you. Otherwise spend the extra $100 bucks and get a good jogging double stroller, or push 2 single strollers at the same time, it really might be easier! My mom sent Bekah this beautiful little frock for her birthday. She wore it to church today and we all agreed she could be the next little Matilda. Too cute, and Topher was looking pretty dapper himself! I've been making this tutu for a bit for my niece who just turned one-it took a ton of tulle-but I love the finished look. My niece lives in Utah-so I grabbed the closest kid (I have a lot to choose from) and stuck it on him. He didn't seem to care one bit! (And in this pic you can see his cute little bottom teeth!) Tess-sweetheart, it'll be sent tomorrow, and I apologize if drool baby aka 'slug' left a trail on it! And I am done making tutu's for awhile! Finally! A birthday party that goes exactly how you visioned it? Impossible? I thought so too-until today! This party went off without a hitch, and was exactly how I had pictured it, but better! The food was bright and fun and the girls were so excited about it-especially these little cuties. The tutu's/decorations were so cute-thank you again April for all your help and fabric and everything! The girls and Topher all enjoyed their picnic lunch of pb and honey or jelly sandwiches, string cheese and teddy grahams and of course their 'Cinderella's pumpkin punch' (apple juice served out of my pumpkin tureen). They watched Sleeping Beauty as they came and as they ate, and it kept everyone calm and in one spot during lunch. Then we played our party games that Bekah wanted to play...we played our Picasso Princess- I had each girl reach in and pull out a piece, and then they put it on not knowing what they were going to get-I was surprised how many got it close to where it should be-but it still turned out silly and the girls had quite a few giggles over it. Then we did the piniata, and they were all little princesses about it-after a couple turns each-I finally busted it open-and they were thrilled with all the fun goodies inside. Then we did cake and presents... My favorite was this apron that my friend Jaime made for her-she knows I love owls. SO cute! She also included all the letters of Bekah's name and a couple hearts in cookie cutters in the pockets-such a great gift. I might have to steal it and speaking of stealing...I think if I changed the waist ribbon, this would fit me! Then the girls got their favor bags that included a ring pop, a candy necklace, a pencil, a yo-yo.... ...and one of these. A full size Hershey bar wrapped in a thank you note. (So cute if I do say so myself!) Then they all got their own tutu's that we personalized with their initial and took a picture of them in front of the castle. I think I heard from every girl at least once that this was the best birthday party they'd ever been to. So all those hours of preparation were worth it. No fits, no boredom, no fighting. Just perfect little princesses! So once again-I must confess my love for the Appah household! For Chad's birthday yesterday, Jason put on the school's mascot's head-Hooty the owl-and went into one of Chad's classes. He sang Happy Birthday with some balloons and even did a little dance. Chad was mortified, it was right in the middle of a quiz. One of Jason's friends got it on his cell phone video, Chad is the one in the orange hoodie on the back row-you mostly see Jason doing his diddy-oh but it is so classic. For some reason I can't embed it onto my blog but here is the link to it. Thanks Jason-you made my day and made Chad, well.....mad, but he will eventually get over it...or get even! So my little girl is now 5! Her birthday was on the 12th and we celebrated the day away! I really can't believe she is so big-she is officially not a baby or even a toddler any more. She's a full fledged kid! I hate it obviously, but my tears have been shed-so I'll get to the fun stuff! I made this castle for her to wake up to as a decoration for her princess party this weekend, but the little stinker came downstairs and caught me with it the night before as I was finishing it up-the reaction though was priceless-and so worth it! 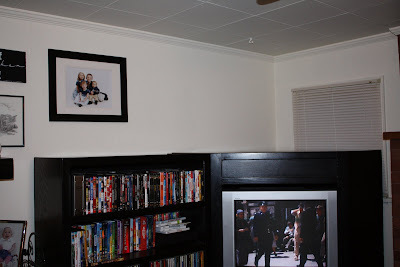 Then I always decorate the kids' rooms while they are sleeping so that they wake up to something fun-(for past years, check out our video blog). Of course she woke up before I had the chance to go up and get it on video and real life reaction shots. She came downstairs all grins and said "I love the balloons mom!" I was upset I missed it, so I made her re-inact it for me, she was more than willing with a funny stretch and yawn and mock surprise on her face and the whole bit. Such a little actress! Then we went and got donuts for breakfast and went to the Appah's for a whole day of fun! April made Bekah's favorite lunch-mac & cheese and apples and the kids got to play for hours. Have I told you how much I love the Appah's? Then Bekah got to join Phoebe at ballet. Talk about an excited little birthday girl! She absolutely loved it and wants to take it now, Chad and I are considering it, but trying to decide if we are up for the commitment level it takes both financially and time wise-but she'll probably win. I mean how cute is she in her little leotard and ballet slippers! After ballet I told her she was going to meet a new friend.... She was soooo not expecting the new friend to be a horse! My friend Suzanne was so very nice and agreed to get one of her horses out and let the kids feed it and brush it and even ride it. Bekah has not stopped talking about how her new friend Rio ate carrots right out of her hand, and showing me how to hold your hand so you don't get nibbled on. She tells anyone who will listen that the horse was being silly that day and rolled in the mud, so she got to brush her. The funny thing was though, is she was scared to ride her-she was a really big horse-but Bekah is usually so all about riding them. I hope she gets over that real quick-I guess we just need to get her around them more! This kid though had no problems getting up there, Suzanne walked Rio slowly and he was all about it, even when the horse got spooked and it ran a bit. Scared me to DEATH, but Topher thought it was great fun! Bekah on the other hand had this look the whole time she was up there! Still she loved being able to see the horse and also Suzanne's dogs of course! Then we headed home for Bekah's choice dinner-cheese pizza and presents. She got spoiled of course with scrapbook kits, a movie, a Sleeping Beauty Barbie and the dumb things I said I would never buy for her-Littlest Pet Shop galore! She got one silly little puppy in her stocking and I swear she loves that thing more than any other toy she owns-so she was beyond ecstatic to get like 5 of those things and a pet shop to put them all in! Then we had cake-she wanted the Funfetti out of the box cupcakes-so that's what she got, I did make her a giant one in a small pyrex bowl which she thought was pretty cool and Topher thought was pretty unfair, but what do you do? I think this is probably the best day she has ever had, as she was going to bed she was giving me a hug and said, "Mom, Thanks for making my birthday so special." Thanks again to Suzanne and April for helping me have the perfect day for her-she really loved it! About 1/2 hour before serving, boil the pasta. In a small saucepan melt butter, add garlic, whipping cream, pepper, parm cheese and crumbled bacon. Whisk together on low for 3-4 minutes. In a large bowl pour sauce over cooked, drained pasta, add chicken and stir. Sprinkle parm cheese on top-we have also done toasted pine nuts or thrown in some cherry or diced tomatoes. All yummy! Christopher wore this new sweater to church on Sunday, I thought he looked cute, then Chad pointed out he looked a little Ron Burgandy-ish. Topher is usually not down with me taking tons of pics of him as of late, but he saw me taking some of Porter and I think he got a little jealous-so he came over in his new favorite get-up (courtesy of my sis-in-law, I still don't know about my 2 year old having a gun...) and asked me to take his picture. Then he brought over his favorite Christmas Present-this Handy Manny toolbox and wanted me to take another picture-obviously showing me that he has options for his future career. Then for good measure-took Porter's toy out of his hands and wanted me to take a picture of that-his 'business man' pose. Silly kid. So my mother in law is the sweetest thing you have ever met. Seriously. Her name is Mona and she works at a Wells Fargo as a teller and everyone just adores her. Case in point-a lady was in there not long ago talking to her about a little album she was putting together, and Mona said she would love to see it. The lady happened to have an extra one in her car, so she gave it to Mona. Mona tried to pay her for it, but the woman said whe could have it for always being so nice and helping her at the bank. Mona knew she wanted to give it to me as soon as she saw it, because it was scrapbook-ish, so the woman wrote down her blog address, so I could get some ideas for the cover. I got this in the mail today, and I opened it up and thought wow! I saw this on Lisa's blog not too long ago-I tried to win one-I really wanted one. I clearly remember the post-it was the one where she was sitting with David Archuletta's dad. I didn't win, but I was stoked to get it in the mail, then the post it note fell out. Do you see the blog address??????? I seriously wanted to cry I was so excited. Mona of course had no idea what an idol Lisa is to scrapbookers worldwide, and was shocked when I told her who she was. Mona said, "But she's so humble and dear!" I think that's why everyone adores Lisa, including me. It's not every day you get a little happy mail with something with one of your idol's own handwriting on it. I will scrap this little treasure and keep it always-and of course have some fun with the recipe book as well! 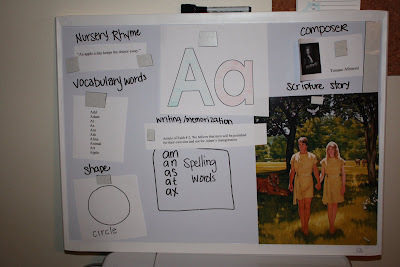 Homeschool Week 1, and HELP! We did it! We made it through week one of homeschooling and we actually enjoyed ourselves! I didn't get to go over everything I wanted to-but I let it go, because let's face it, she's doing kindergarten and first grade work and she hasn't turned 5 yet! We are starting slow, and I am trying to include Christopher in the lessons as well. We started with the short Aa sound this week and Bekah passed her spelling test easily after a couple days of practice and with math-I didn't have to do anything to teach her to add. We just added 0, 1 and 2's to just about anything and she knew it. Her perfectionist nature came out of course when it came time for any art project or writing-and it was not unusual for her to be working well until dinner time on something. That is one of the reasons I think I feel like this is such a good fit for her-at preschool she was always rushed to move on to the next thing, when she was trying to cut perfect little circles and glue them exactly where they went, while the teacher was just trying to keep the other kids from eating the glue. So far so good. I think this will be great. Hard, but great. Now on to the HELP part. I need your creative genius! 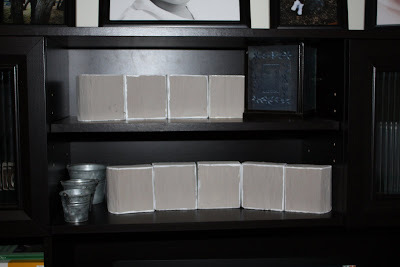 I made these blocks-but am having some serious well writers block (my mom will laugh) at what to write on them. They are on my desk-any ideas? I need a (clean) 4 letter word and a 5 letter word, that work well together. Then I really wanted some tall pillar black candlesticks to put on top of my media cabinet and maybe a topiary or two, I was sick of my baskets up there. Well my mom got me something better-these really great handmade wooden candlesticks that are about 3 feet tall, there's only one problem-they look lots better on my mantle. Now I have this blank space and I'm drawing a blank (again my mom will laugh at my little puns!) for what to put up there. Any ideas will be greatly appreciated-if you have pictures of something that will work, that would be immensly helpful!